Have you heard of Feng shui? This is a “system of laws considered to govern spatial arrangement and orientation in relation to the flow of energy.” Translation: how you arrange your furniture can affect how your home “feels.” There’s actually some truth to this in the sense that a room with an open flow that is free of clutter actually feels more comfortable. Any talk of getting rid of clutter needs to include Junk King Bucks County. These are the junk removal experts who might not be able to help you rearrange your furniture but they can certainly open up a lot of space by clearing the clutter from your home. Clutter can mean a lot of little things, a bunch of big things or combination of both. The two-man moving crew assigned to you by Junk King Bucks County won’t have any issues taking care of any of those scenarios. It probably doesn’t make sense to hire them take away old magazines and newspapers unless of course you have an entire garage full of them. 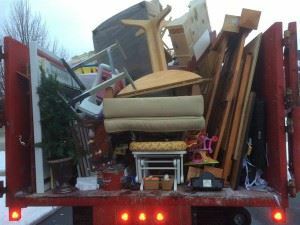 When you’ve got clutter like a worn out sofa down in the basement or mattress up in the attic then you definitely need the help of Junk King Bucks County. Although you may found a way to get those items into those places is no reason why you need to strain your back by moving them on your own. The Junk King Bucks County team will lift any size object right from the spot. Clutter can also be getting in the way of a clear closet. You can tell right away that you have trouble in your closet when you can’t separate what’s on the hangers. That means you need to pull out all those outfits that aren’t working for you anymore. Don’t think that they’ll end up in the trash. Instead, Junk King Bucks County will strive to make sure reusable items find their way to a local charity. That holds true for your old clothing, furniture and other household goods. When you’re ready to get rid of all the clutter in your home Junk King Bucks County has you covered. This entry was posted in clutter, Junk Hauling, junk removal and tagged clutter, Junk King, junk removal on December 31, 2016 by Stewart Gritz. Last updated August 14, 2017 .